It’s easy to get wrapped up in the product we are creating, at the expense of recognizing its end result. What sells is not pixels, posters, or paint. What people want is the outcome. In sales circles, they frequently talk about a person selling drills. To sell a drill, you don’t talk about the noise it makes, the rechargeable battery, or the heft of its handle. You talk about the hole it makes. Because you’re really not selling a drill… you’re selling holes. Similarly, in marketing circles, they talk about selling the benefits, not the features. Benefits are what the customer really wants. The outcome is more deeply connected to the emotions of your audience than the features or process are. Which is a good thing, because emotion is the true currency of art, not facts and figures. 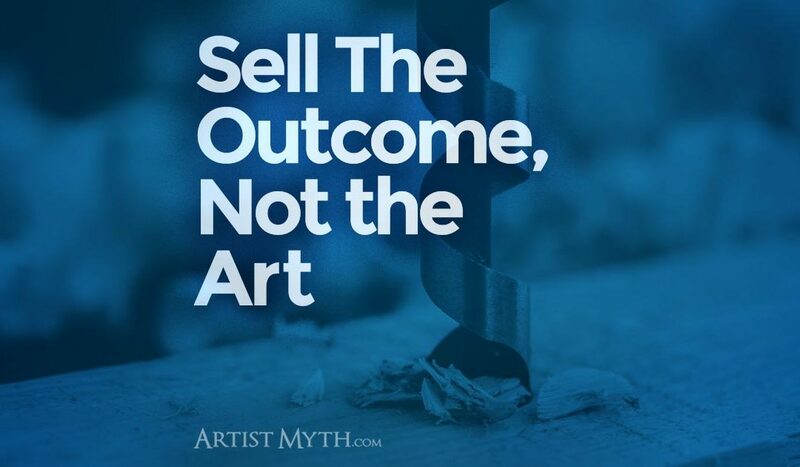 What outcome are you selling as an artist? Focusing on the outcome takes imagination. But as artists, we should be better than most people at using that special set of muscles in our heads… let’s call them imagination muscles. So that shouldn’t be too much of a problem, right? Well, that’s easier said than done, isn’t it? Because many of us tend to overthink things. We get wrapped up in the creative moment, the divine act of creation. When we sit down to make stuff, our thoughts roam like a herd of wild stallions. And those stallions might go places we don’t necessarily want them to go…places that make us doubt ourselves. But when we focus on the end result of our art, the internal dialogue might be different… and it should include your ideal customer. Your ideal customer, the person who you are making your art for, should be fixed firmly in your head. If you don’t know who they are, that’s okay… make somebody up! But that made-up person should be supportive, glad you made the wonderful thing you made, and superbly conscious of the value of what you’ve given them. Go ahead, use those imagination muscles to think about your very special customer, and how they will feel about your art. Go all the way. It may bring tears to your eyes when you think about all the life that will be lived under the watchful eye of something you made. To your jaded, critical eyes, that art might bother you because you never did get that certain shade just right. Or maybe the website you made for that client rubs you the wrong way because something about it didn’t quite look the way you thought it should. But take leave of the self-criticism for a moment and project your thoughts into the future… to your customer. Sure, they don’t see your art the same way you do… and that’s a good thing. Learn to not only accept, but appreciate it. Your customer doesn’t think about the long hours you spent agonizing over color choices or patterns. They aren’t aware of the internal conflict you had over whether to move a line two pixels to the right or left. They don’t care. What they care about is a whole… the entirety of the work you’ve given them from your very own hands. To them, your art will always be more finished than you think it is. Think of them as an alien civilization who, upon accepting your gift of Nutella on sliced bread, their eyes bulge and they make strange noises of delight. Sure, they’re weird and different than you … but you’ve given them something they never experienced before. The explosion of inspiration they get from your art is something that you have to get into their heads to experience for yourself. So spare some of those creative thoughts for them… your audience, your customer, that special alien person who actually likes your art and wants to purchase it. Your life as a creator will be much easier, more inspired, more personally fulfilling when you do. sometimes needs are generic, premium customers have however specific needs. I’d also be adding that you sell the process as well, especially as an artist. Sharing your struggle on a blog post, pictures of you at 3am in your studio etc are the most effective way to connect with people and turn them into relationships, fans and evangialists. Thank you, Guilherme. Yes, the entire process can be something that we “sell” by just sharing it… and there’s no selling more genuine than that! Thank you for the article Mike. It’s something I’ve been thinking about but haven’t come up with the answer yet. I’m going to “steal” your statement about my ideal person, “This painting completes my room and is uniquely me”, just for now until I figure it out. Steal away, Katherine! I’m very glad you resonated with that statement and hope it helps you envision your audience… because fans really do say that. Thanks for your thoughtful words, Matt! Thank you for the thoughtful article and its interesting reading the comments too. However I have a question, how do I balance the two sides of this- the act of creation versus the need to sell? I have up until recently been a wildlife artist and wildlife art sells but, whilst I have loved doing this, over recent years I have felt more and more like I was creating purely for the audience, to the point where I no longer paint wildlife! The scales tipped too far one way! Now they have tipped too far the other way BUT I think you are right, whilst at the moment I am creating and learning for myself I have a creative message to convey and for that I will need an audience or I will be shouting into the wind! I feel or hope that the key is to find the right audience for me and not create purely for the audience. I think this is a common struggle and I don’t think I’m alone in this. Thank you for your thoughtful questions, Suzy. I can certainly relate with the dual pressure of creation to satisfy an audience while also satisfying my internal artistic sense. I believe one of our central goals is to strive for balance in these two parts of our life… because we need both to survive. It can be hard when we’ve found a responsive (even paying) audience to feel the freedom to branch out. But there are a lot of ways to explore new horizons… we can start a new website, find an entirely new art market somewhere else. 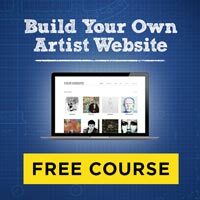 If we feel like our other audience would be compromised, we can even create an alter ego or pen name and do our explorations under that. If you feel comfortable doing so, you can even hire others to do your paying gigs while you explore. If you have a body of work, and you’re trying to get away from constant requests for commission work, you can find new ways to sell it such as licensing (which works really well for wildlife art) or publishing a book of your art. This frees up your time to do more creation purely for yourself. Hope that helps… I wish you all the best in your quest for balance! Thank you so much for your reply and useful comments. You have given me much to think about so thank you. Thanks, Suzy! I really appreciate you being such an engaged reader of my blog, and I’m glad it helped you.